This technology is constructional solution of outside facings for new or existing buildings, made of plates, natural or artificial stone or ceramic plates with ventilated air gap between rear surface of facing and background. The solution enables installation of thermal insulation on walls surface. depending on kind of the base, insulation thickness, possibly walls irregularitie (mainly regards reconstructed objects), facing loading and static calculations. 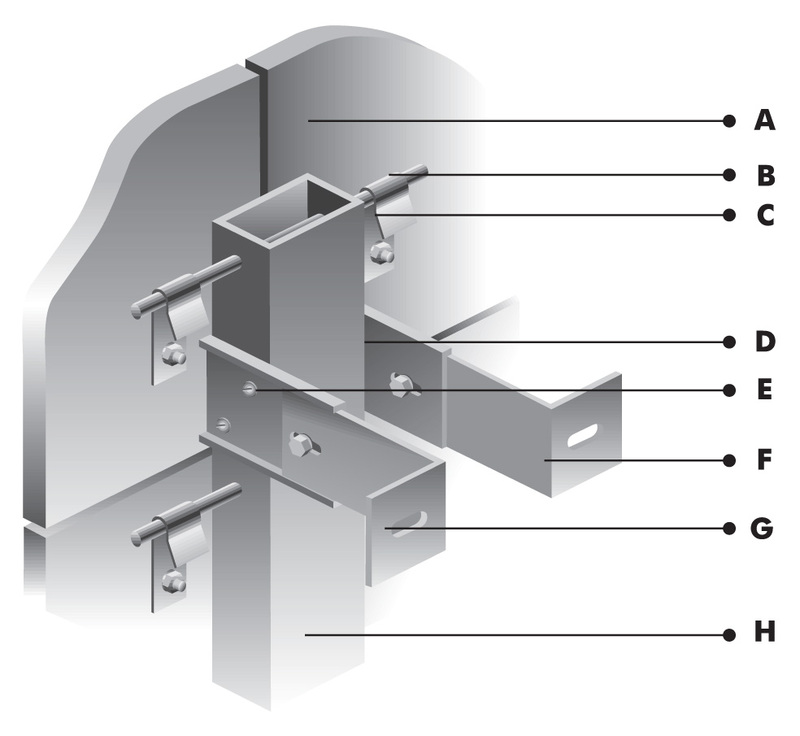 The anchors (F) are provided with holes for stable and slidable fixation of framework and they are fixed to the main wall by means of stretcher bolts (G). Types of stretcher bolts are chosen depending on the kind of main wall (full brick, Porotherm, iron cast, gas concrete, steel or wooden construction etc.) and static calculations. The facing itself hangs on the supportive framework by means of special connector (C) made of stainless steel – solution of company VESPOL INVEST. The connector (C) is made of elastic hook anchored in specially drilled and milled pockets. Quantity of con-nectors for one module of facing results from static calculations. 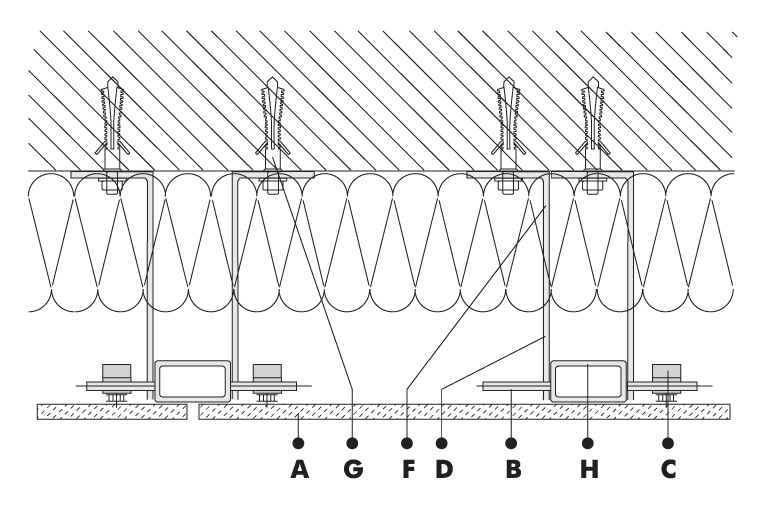 The base for static calculations is as follows: computational strength characteristic for given connector, kind and dimensions of the fa-cing, height of the building, wind loads etc. Connection between supportive facing (A) and framework (H) is filled with silicone glue. The silicone is used for elastic placing of the facing and eliminates transferring of possible vibrations from building through framework onto the facing. Kind, density and thickness of thermal insulation results from thermal-technical calculations. Hydrophobic, hard mineral wool is used as thermal insulation. 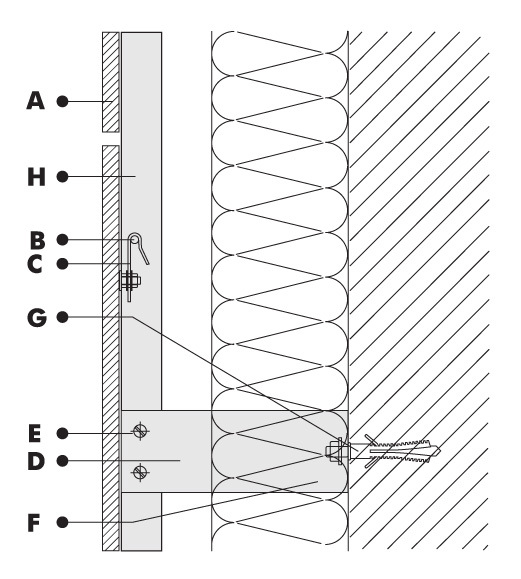 Insulation boards are fixed to the walls by means of head connectors of plastics. It is possible to cover the insulation by steam-permeable foil. A kind of elevation facing – natural stone (granite, marble), artificial stone – gres, laminate. Natural stone: dimensions of facing boards are settled by the architect and the designer of company VESPOL INVEST for each concrete building. In this technology thickness of used stone is 2 cm at any height of the building (there are differences in quantity and kind of used connectors). It reduces elevation weight of 30 to 50% in comparison with traditional fixing. 40/60, 60/60, 80/80, 50/100, 60/120, 100/100, 120/180 cm. Before fixing the elevation facing, ceramic and stone, the rear surface of boards is glued with net of glass fibre. It secures against falling of the facing being mechanically damaged on elevation.